Let There Be Light! is the fourth extra level in the game Yoshi's Island DS. It is full of dangers such as spikes, Bullet Bills, spiked arms, Ice Blocks and the darkness in the stage itself. Yoshi must light torches to see where he is going. The name is a reference to the Biblical passage Genesis 1:3, in which the quote "Let there be light" is attributed to God. 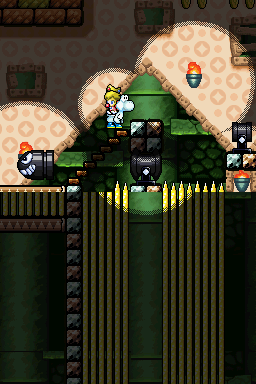 The level starts with a Stork Stop and a spike network which leads to a door with more spikes, enemies, and platforms. A Middle Ring comes soon after, along with a Warp Pipe which takes Yoshi outside to an area with moving platforms and obstacles, with another pipe nearby. The pipe takes Yoshi back inside to an area where he has to press a switch, which activates some red blocks. These red blocks allow him to climb up to the Middle Ring and bypass some enemies. After going past some Zeus Guys and spikes, Yoshi should enter a nearby pipe which takes him to the goal roulette. German Es werde Licht! "Let There Be Light!" This page was last edited on April 15, 2019, at 02:19.